The gorgeous pewter shepherds' crook bookmark has been cast from lead- and antimony-free pewter, and features images of butterflies and flowers on both sides. I've made a Cheyenne stitch image (from a pattern by Dye Shelbourn) of a brightly coloured butterfly on a dahlia. Please note that in Cheyenne stitch, each teeny-tiny bead is sewn into place one at a time: a painstaking and time-consuming operation. The pewter piece is about 5-5/8" long. 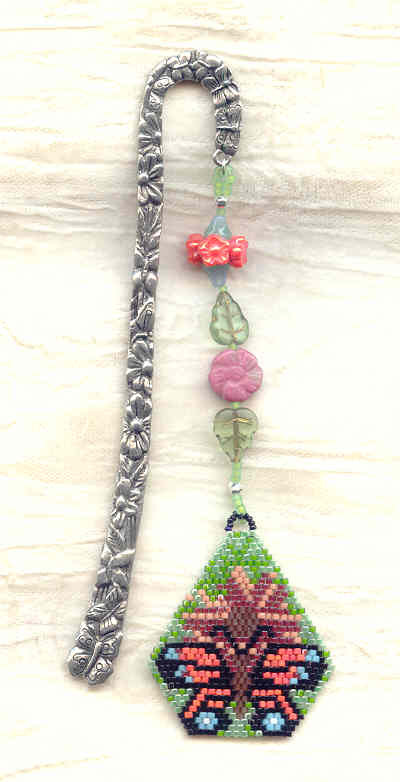 Here's a great gift idea for that hard-to-buy-for person on your gift list, or for the gardener who has everything .... except a hand-beaded bookmark to keep a place in the Gardener's Almanac.